Fulfilling the Great Commission by providing an equal opportunity to train the "called of God" who cannot enroll in a regular Bible school due to illiteracy or being unable to meet the minimum educational requirements. Olbi uses the latest technology and innovation to educate oral learners in an affordable distant education model not requiring regular class attendance nor internet connection. Leveraging local churches as olBi centers to enroll, guide, motivate, and mentor students creates an economical institute model that is affordable for every student. Each student will enroll in courses and receive the classes on Micro SD cards at the local olBi center. The card is inserted into the student's mobile phone. Students will be able to return to their homes where they can view and study the lessons repeatedly until they understand the content. Each lesson includes thought provoking related questions to help the student learn the content and apply the principles to their lives. Each course is completed when the student returns to the local olBi center for review, mentorship, and an oral examine. Their ongoing practical ministry will be carefully monitored and recorded along with their exam scores creating a record for their education. Upon completion of all course, having passed a final oral exam, and having met the practical ministry requirements, the student will receive a diploma in Practical Ministry and Theology. Has been a member in good standing with a local church for at least one year. 2. Additionally students must have a compatible mobile phone with a Micro SD memory slot and be capable of playing mp4 or 3gp video files. Each student must provide their own Micro SD memory card. There are no educational prerequisites for enrollment in olBi. Students who have matriculated or graduated should enroll in one of the many fine Bible Colleges available. 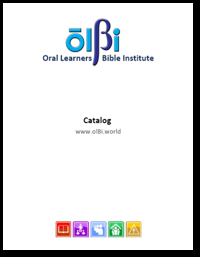 olBi is specifically intended to meet the educational needs of illiterate, functionally illiterate, or people who are oral learners. Each olBi course will have a set tuition which will include the course materials, mentorship, and the exam fee. The credit hour tuition rate is set by the national leadership for each country and region. One method would have thel credit hour tuition fixed to the daily wages of a laborer. Each credit will cost 1/3 of a day's wages for the average laborer. Thus, a 3 credit hour course will cost the equivalent of one day's wages for a laborer.